I want to introduce news I read the other day. How many of you use smart phone? If you use one, BE CAREFUL!! 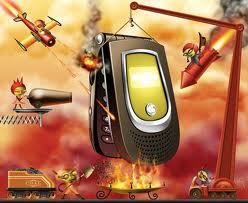 From the beginning of this year, Malware for smart phone is increasing rapidly. A number of Malware against iPhone, Android, or Black Berry in the world was 3 in 2009, 5 in 2010, but there are over 40 until the middle of October this year. The reason why the number of Malware increased suddenly is not only because more people started to use smart phone. Especially for Android, we can open the OS and application software to the public. Thus it is easy for the Malware creator to attack. In fact, the major way to get Malware is through downloading application software. Even though there is anti-virus software, it is not certain your phone can be safe for 100%. A vicious Malware takes root authority, and works outside of anti-virus software. Because the Malware has root authority, e-mails, address book, pictures, and any other information can be accessed. What is worse, there is a vicious Malware that doesn’t tell users that their phone is infected, so you may send someone’s information every time you make a call, text, or take a picture. Now, we can't live without cell phone. It is necessary to communicate, to make friends, to make better relationships, or for bussiness. Smart Phone is much convenience (seriously, my phone is not smart phone so I have many difficulty), but it also is dangerous. If Malware keeps expanding, and if anti-virus softwares don't work well, what can we do? so...do you still want to change your phone to smart phone? What is the difference between Winny and Malware? Eventhough the anti-virus software cannot protect 100%!!?? It is problem!! When I reaad the news, I have completely no idea what we can (or should) do for the malicious software...do you have any idea what we can do for this problem? I don't have any solutions either. I agree that it is a big problem. Something in your blogpost that I find interesting is the idea that you suggest people can't live without their mobile phones. Do you really believe this. Life would certainly be different but I'm not sure it would be worse. I'd be interested to hear your opinion. One more point, please remember that WB 4 and 5 are supposed to include a question about the topic for the final exam. Can you amend your post to include one, please? I'm pretty sure people can live even if there's no cell phone, but if it suddenly disapper right now, we all will get confused. and I think people (especially younger generation) use cell phone to measure friendship or any other relationships. Moreover, it plays an important part in bussiness, too. Quick reply or e-mail service helps people to have easier and quicker bussiness communication. These are why I think cell phone today is necessity for us. And another thing that would happen if cell phones were to disappear is that a lot of people wouldn't have anything to look at while walking around or riding the trains. Thanks for posting a question for final. While I agree malware is an increasing problem. I think I will still take my chances and use my smart phone. It's too important for me know to use it. I guess I'll have to continue to put my faith in the anti-virus software. yes! we won't have anything to do while we are alone if there is no cell phone in the world. this might cause one of the huge confusions! I actually wanna change my cell phone to smart phone, but I still can't...since I read the news...yes we need to know about the malware problems at least.